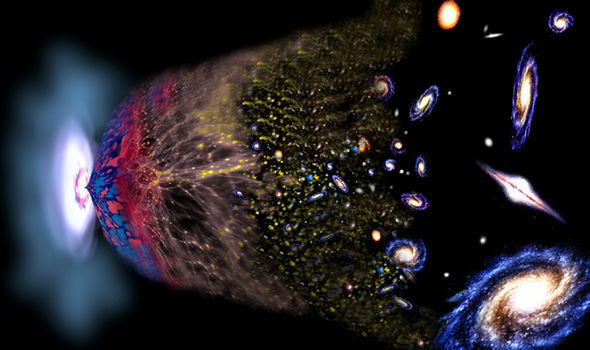 Under Inflation Theory the minute energies and lifetime of the virtual particle become infinitely magnified, finally resulting in our 13.8 Billion-year-old universe. Just to make things more complex Dr Mir says we have been trying to answer the question ‘how did the universe come from nothing?’ all wrong. According to the astonishing findings, the question is irrelevant as the universe STILL is nothing. Dr Mir Faizal said: “Something did not come from nothing. The universe still is nothing, it’s just more elegantly ordered nothing.” He also added that the negative gravitational energy of the cosmos and the positive matter energy of the cosmos essentially balanced out and generated a zero sum. as grad students and the like, you should know the importance of peer reveiw and general academic and scientific honesty. Please start including actual links to scientific journals where your blog gets its information. When you link to another website, link to the actual page on the website, not just the main website example linking to msnbc.com is different than msnbc.com/science/health/somethingsomething...... alot of your links appear more like msnbc.com.. most readers arent going to waste their time having to manually hunt down your links. unless of course your goal is fake science or "sort of science", in which case, great job! This article is shameless propaganda intended to propagandize the stupid and credulous into atheism. The scientific theory outlined within is a minor variant of that proposed by Lawrence Krauss, and the philosophical and theological implications he drew from it have been duly ripped to shreds by authors who are actually knowledgable about philosophy and theology (For a quick read, I suggest David Albert's review of Krauss' "A Universe From Nothing" in the New York Times.) The theory may or may not be correct, but it does not in any case rout the classical First Cause arguments of theology. The inflationary cosmogonies start with a pre-existing quantum vacuum, acted upon by a pre-existing set of natural laws. Neither a quantum vacuum, nor a set of physical laws, are nothing- ergo- the theory is incapable of explaining how something comes from nothing. As well, the suggestion that the Universe *is* nothing, since the energy is evenly balanced, is asinine on the face of it. Even if we arbitrarily describe the Universe only in terms of being a separation of energy, a separation is still something. Newton said for every action, there is an equal and opposite reaction; by Krauss' and Mir's logic, I would suppose they would say action doesn't exist. People of the United Kingdom: There exists in your country a journalistic elite, who have no respect for your intelligence, and who are cynically trying to propagandize you into atheism. The fact that so much of the population are shedding their religious beliefs means only that they're yielding to the efforts of the BBC, the Guardian, et al. to bludgeon them into a new orthodoxy. The rise of atheism among your citizens is not a triumph of Reason or Rationality or Science or any of the other self-laudatory suppositions of atheists, it is a triumph of propaganda. Wake up. Don't let them con you into abandoning your intellectual heritage, by appealing to your foolish vanity. Wow. That's an impressive amount of poppycock stuffed into such a short article. At least when Hawking, Feynman et al. translate their tradecraft into popular speak, it's informed by the underlying mathematics, as limiting as this might be. In contrast, this article reads like a Mad Magazine parody of their work.